So how would Murray like a rematch? "We'd love it. 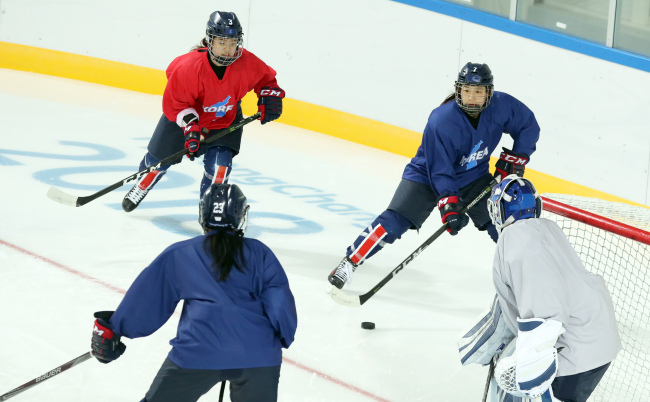 After that game was done (on Wednesday), we wanted another shot right away," Murray told Yonhap News Agency after Friday's practice at Kwandong Hockey Training Centre in Gangneung. "Obviously, we're going to play every game to win. I hope we get another chance." Murray and her players have had to deal with a great deal of outside distractions during the Olympics. Their inaugural Olympic game, against Switzerland last Saturday, was attended by South Korean President Moon Jae-in, International Olympic Committee President Thomas Bach and Kim Yo-jong, sister of North Korean leader Kim Jong-un. Huge throngs of media have been following this team, though they have been more interested in off-ice issues -- such as how the players were getting along and how they were communicating when they didn't all speak the same language -- than in on-ice performances. The luster could be waning, though, now that the team has lost three games by a combined 20-1 and has no chance of winning a medal. And there have already been enough stories written about the players' rapport and camaraderie that it'd be difficult to find anything fresh from that angle. But Murray said hardly anything has changed within the team. "So from outside, maybe the pressure is off. But we still want to win," she said. "We're still working hard toward that. I think the girls are getting more comfortable after playing three games. They're getting used to it. They're just more confident." Murray has been tinkering with her lines over the first three games while keeping her top unit intact. For Friday's practice, she promoted winger Choi Ji-yeon from the second line to the first. Choi is second on the team with six shots on goal so far. "Ji-yeon has been playing really well, and we thought we'd give her some incentive," Murray said. "'You've been playing well. Let's try you on the first line.' We had a great practice today. The girls were flying. I hope we can sneak out a win. Anything can happen."